這是QU 文理學院年度的師生同歡晚會。 中文學生根據中國四大古典名著其中三部中的角色，身著中國傳統服飾。 這三部名著是“白蛇傳”、“牛郎織女” 和 “孟姜女哭倒長城”。進京趕考的學者服飾也在這邊介紹。由於女性角色的短缺，“織女”的角色由男學生扮演，感謝這位學生的傾囊相助。It is a yearly QU CAS Cabaret, at which Chinese students had dressed up traditional Chinese costumes mainly based on the roles from three of the Four Chinese Classics, "The Legend of the Lady White Snake", "Cowherd and Weaver", and "Meng Jiangnu Cried the Great Wall Down". The outfits of the old time scholars heading for Imperial Examination were also show-cased here. Due to the shortage of the female role, the character of "Weaver" was cosplayed by a male student, whose assistance was greatly appreciated. 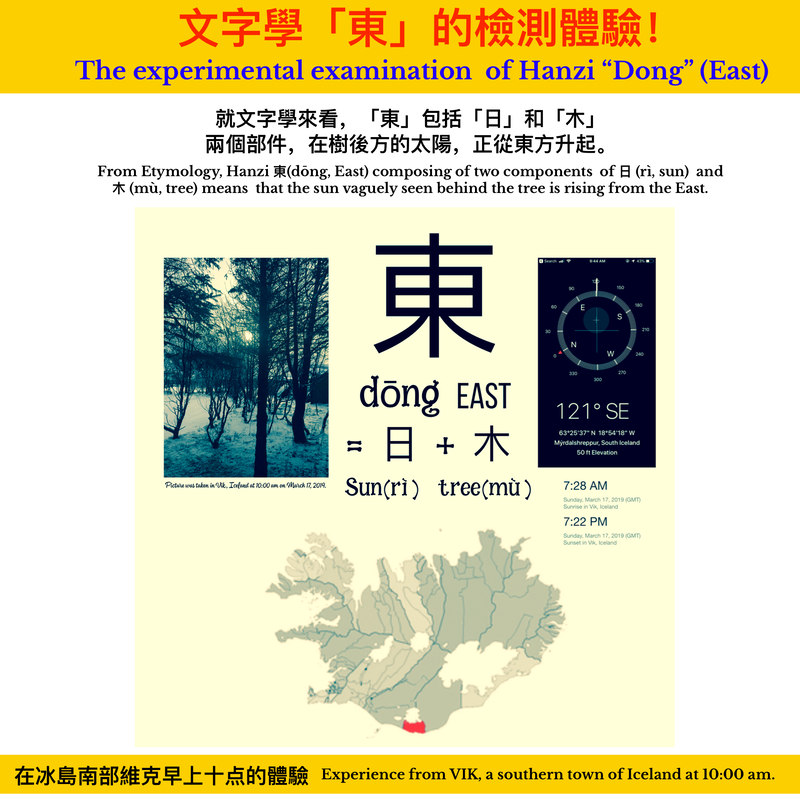 東 dōng，East, Associative Compound. Sun in the tree, the direction where the sunrise starts. 西 xī，Birds rest in the nest during the sunset in the direction of the west. 南 nán，The grass and trees flourish in the south. 北 běi，Two persons back to back. The emperor faced the south. That said, the direction of the back is "north". 豬年快樂、諸事呈祥！Happy and Prosperous on the Year of Pig! Theresa May, Prime Minister of United Kingdom delivered a warm Chinese New Year message. Click here for more Chinese New Year information. As the year of 2018 is towards the end, I made this video and wish you a very Merry Christmas and a Happy New Year. While cherishing the blessings and be grateful the happiness and peace every day, we all cheers for a New Year to come! 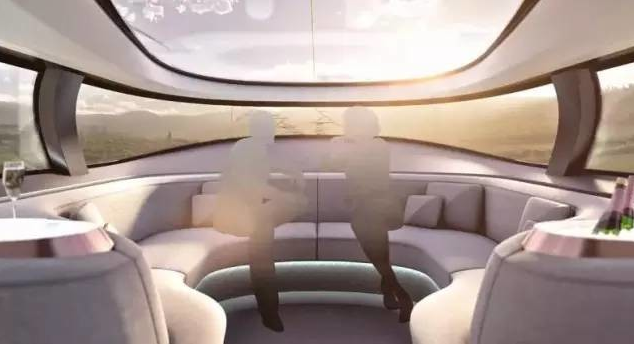 人工智能將改變我們的生活。AI (Artificial Intelligence) is going to change our life. 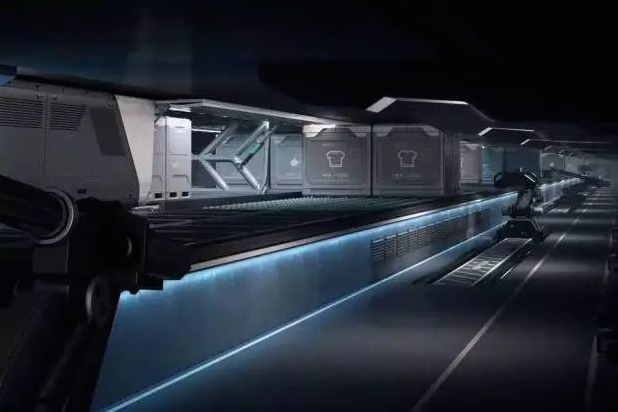 ​人機耦合的時代來臨，看人工智能如何改變我們的社會？這個影帶借由在中國第二次世界智能大會發表合成來自美國總統川普的祝賀語，以及新近新華社發佈的人工智能新聞主播，提醒大家未來人機耦合的現象將無可避免。The Era of Man-Machine coupling is coming. 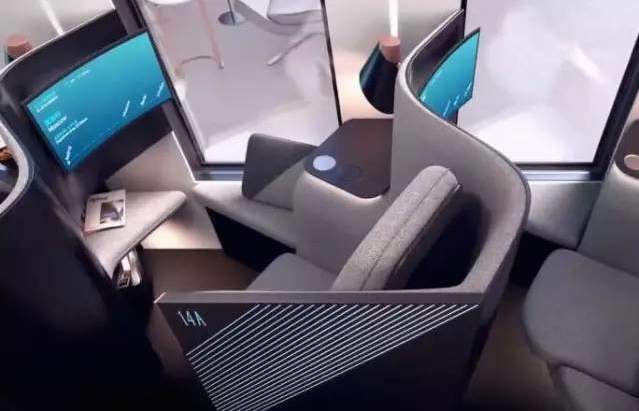 See how Artificial Intelligence can change our society? This video made use of the speech congratulated from the US president Trump at the 2nd World Intelligence Congress held in China, and also the newly released Artificial Intelligence News Anchor by Xinhua News to remind us the phenomenon of man-machine coupling is inevitable in the future. Chinese is getting important. Several factors were presented based on the powerful entity, strong economy, enriched cultures and heritage with which China is equipped for the current,. Chinese is the most spoken language in the world due to its largest population. It is also becoming a very important internet language, which is only second to the English. Learning Chinese has great aspects such as increasing the job opportunities, broadening the world vision to the East, enhancing and stimulating your brain...etc. The production of Pu'er Tea Cake was experienced at a weekend trade show which featured the ancient Tea-Horse Road in the UNESCO city，Lijiang, Yunnan of China. The tea leaves were first put into the tea bag, which was then set under a high-temperature steam, and finally transformed into a finished product after being shaped and stone-pressed. It became an excellent souvenir or a present after being wrapped and packaged inside a gift box. 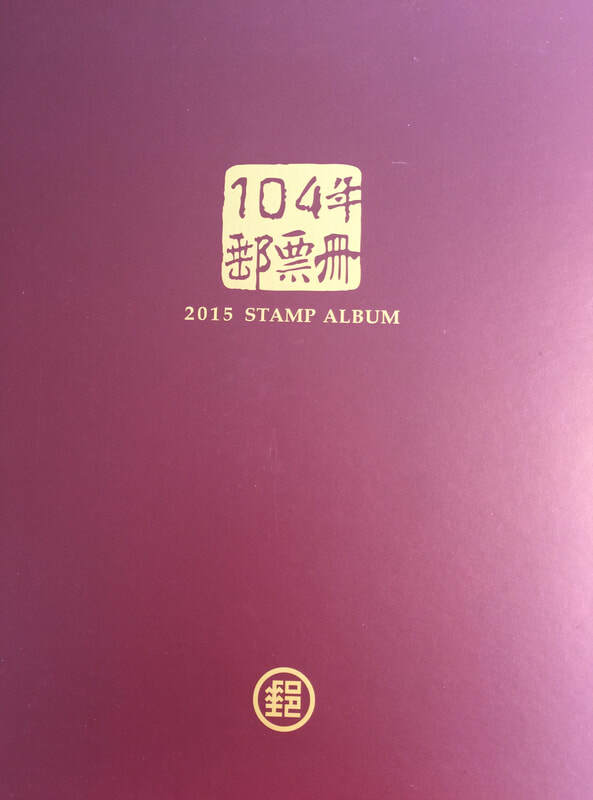 楚河漢界的典故，源於公元前205漢王劉邦和西楚霸王項羽的長期對峙，最後項羽輸了，決定和劉邦簽署停戰協定-，也就是位於河南滎陽黄河南岸广武山上的鴻溝，這條鴻溝寬200米、長800米，一分在西邊的漢王和在東邊的西楚霸王，從此楚河漢界表示敵對雙方兩大勢力的分界線。 Chinese Idiom "chǔ hé hàn jiè", indicating a clear boundary in between two opposing powers. It was dated back a battle happened on 205 BC between Liu Bang and Xiang Yu. After the long-time confrontation， Xiang Yu lost and decided to sign with Liu Bang an armistice agreement. The dividing gap which is 200 meters wide and 800 meters long, is on the Guangwu Mountain on the south bank of the Yellow River in Fuyang, Henan. 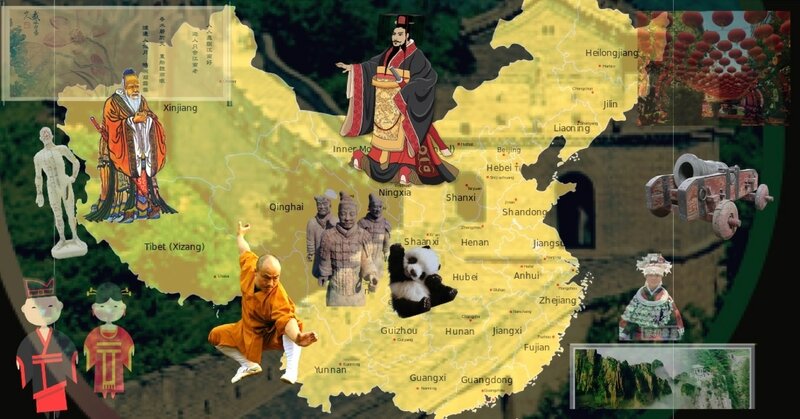 It separated Han King, Liu Bang in the west and Xichu Ba King in the east. From then on, Chu He Han Jie has expressed the dividing line between the two opposing forces. 走出以萬聖節為主題的語言餐桌，瑟瑟的秋風和幢幢的樹影，為今天的西洋鬼節添加不少鬼魅的氣氛。Walking out of the Halloween-themed language table, I felt the autumn wind and the tree shadows added a lot of ghostly atmosphere to today's Western Ghost Festival. 看看安娜蜂鳥的瞬間變臉，與川劇變臉竟有異曲同工之妙。Take a look! The sudden Face Off of the Anna's Hummingbird possesses the same uniqueness of China Sichuan Opera's Changing face. A Chinese Ancient Mythology portrayed the origins of “Hòuyì shè rì” and "Cháng é bēn yuè" stories. Houyi saved the withered earth by shooting down nine out of 10 suns with his bow. He became a hero and received the longevity medicine from the Yellow Emperor, but it was accidentally eaten by her beautiful wife-Cháng é who flew to the moon with the jade rabbit. 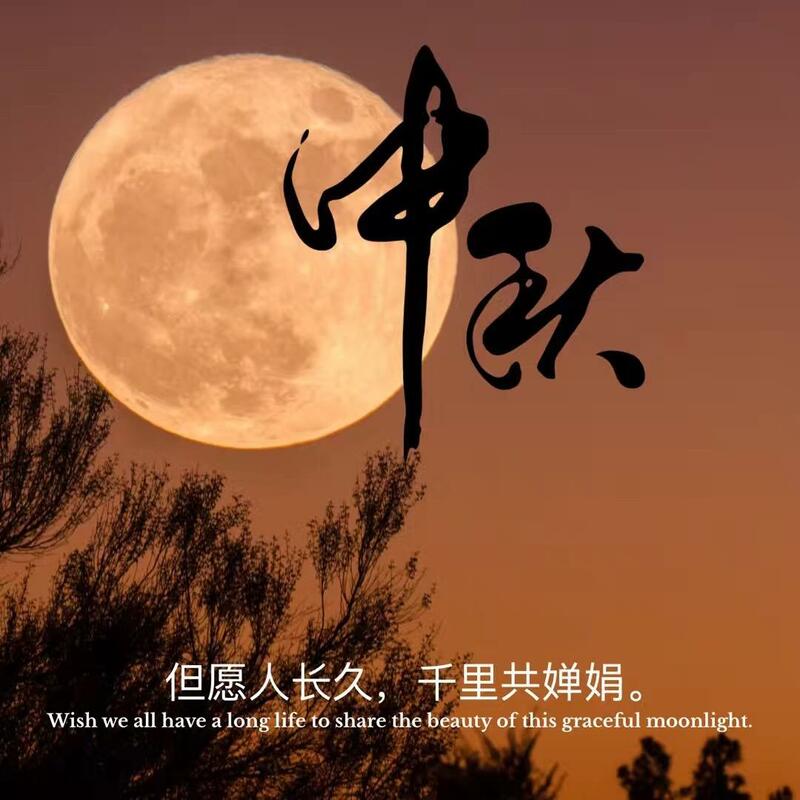 For the sympathy of this grieving & seperable couple, the day of August 15th on the lunar calendar is designated as the "Mid-Autumn Festival", which is the time to reunite the family and enjoy the moon cake with the love ones. Shuidiao Getou (Water Song) by Su Shi at Song Dynasty: "Wish we all have a long life to share the beauty of this graceful moonlight". ​The Book of Changes: "Tian Xingjian, a gentleman to self-improvement; terrain Kun, gentleman with virtue!" In the beginning of the new semester, I encourage myself to be diligent, hardworking, honest and sincere, and kind and forgive others. All are founded on the study of the traditional Chinese philosophy, Yi-Jing. 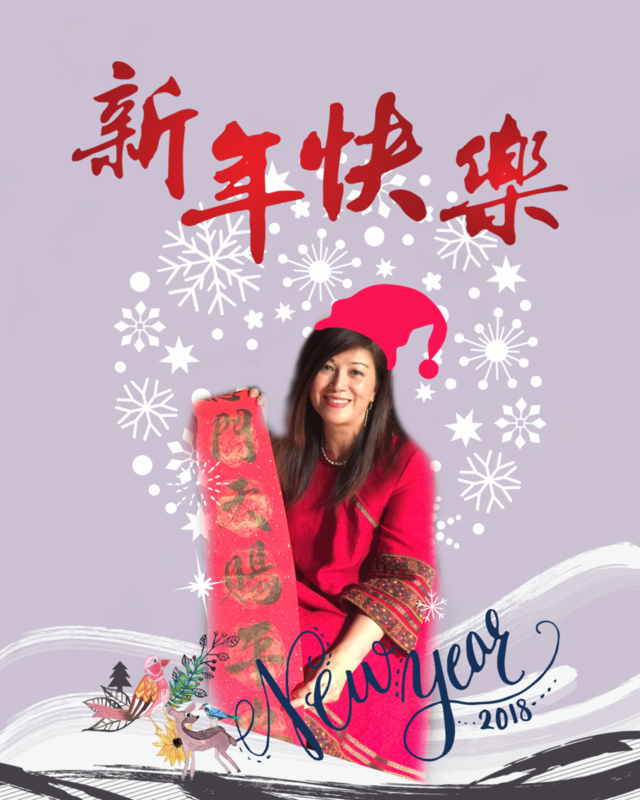 新年快乐！新年快樂！Xīnnián kuàilè! Happy New Year! Looking back the year of 2017 while anticipating 2018, I wish everyone with my upmost blessing "Great happiness, Luckiness and Safety in 2018, and Happy New Year!" 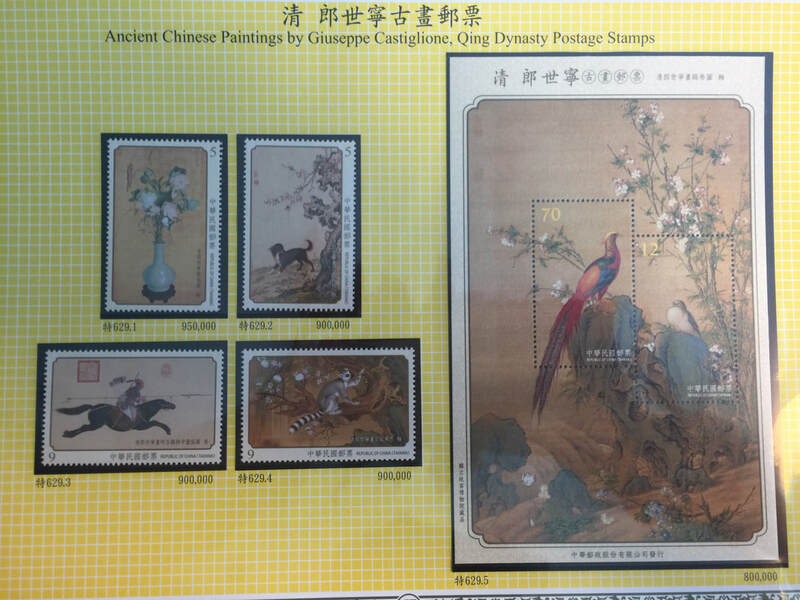 The Art Paintings of Giuseppe, the Royal Painter in China. Giuseppe Castiglione (July 19, 1688 - July 17, 1766), Italian. 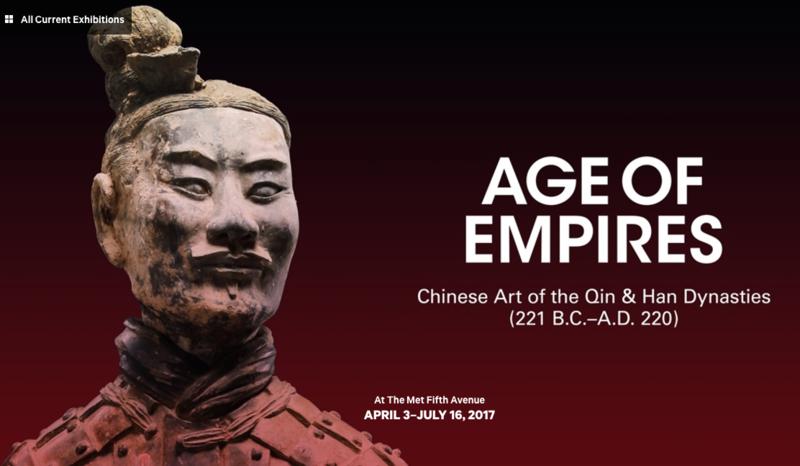 He is a famous royal painter in China and respected highly from the governments ruled by the Emperors of Kangxi, Yongzheng, and Qianlong. 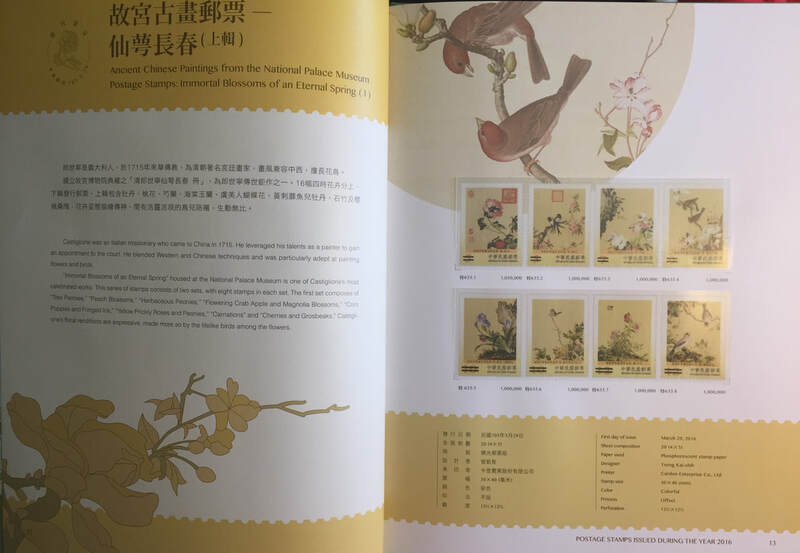 Although he was a missionaries, he was not expelled from the ban on religious intercession ordered by the Yongzheng King because of its superb artistic skills. Castiglione has left many masterpieces to the world. 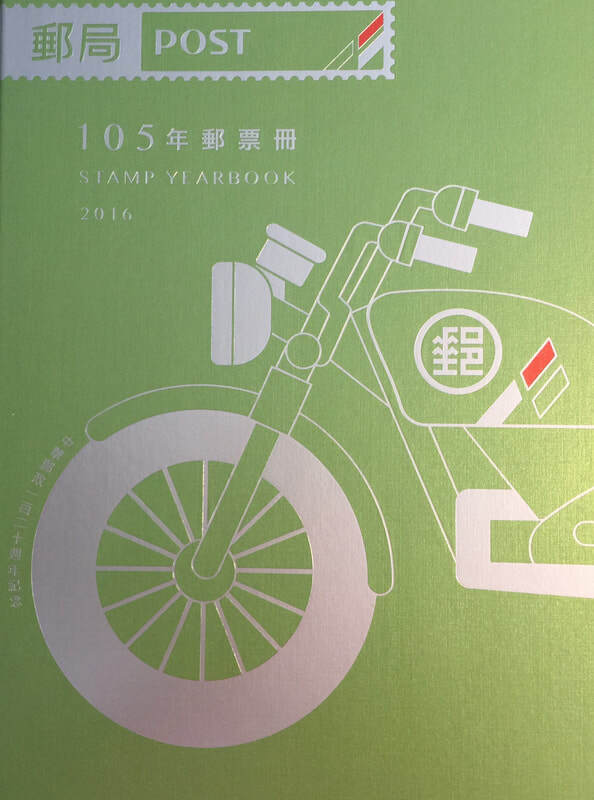 Taiwan's Chunghwa Post published part of his words in the 2014 and 2015 stamp collections. 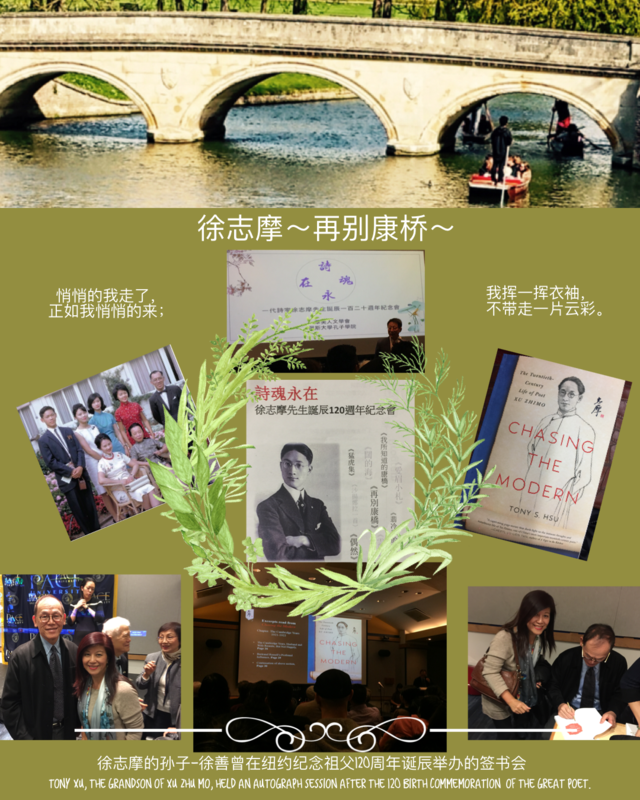 NYC held the Great Poet, Zhimo Xu's 120 Birth Commemoration. from "A Second Farewell to Cambridge,"1928. Not to bring away a patch of cloud. 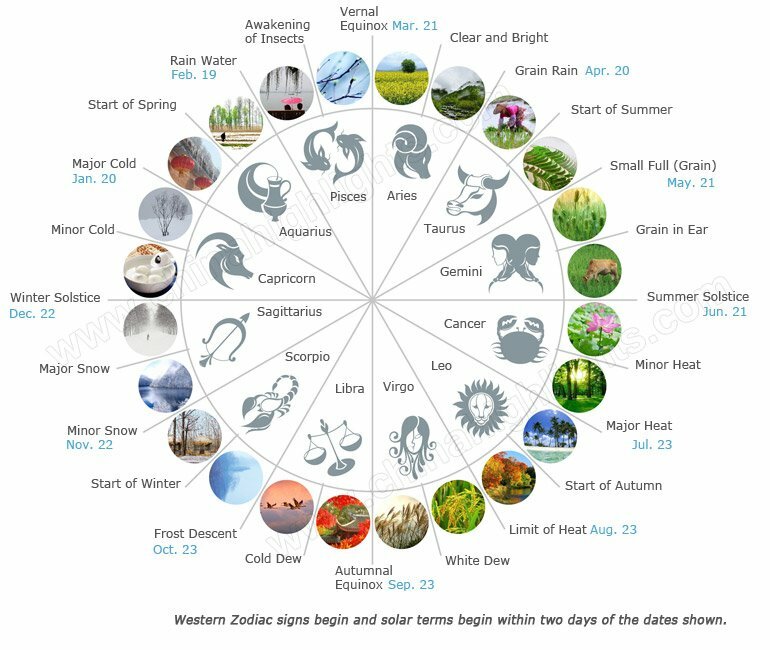 According to the Chinese Lunar Calendar, there are twenty-four Solar Terms. The Beginning of Spring, the Beginning of Summer, the Beginning of Autumn and the Beginning of Winter mark the start of the four seasons. The Vernal Equinox and the Autumnal Equinox are the two points where the day and night are equal. The Summer Solstice has the longest day and shortest night in a year, while the opposite is true for the Winter Solstice. The Rain Water means the start of the Spring. The Walking of Insects indicates that the spring thunder awakens hibernating insects. The Pure Brightness means the onset of spring when a bright and clean spring scene replaces the cold, withered and yellow scene of winter. The Grain Rain indicates that from that day, there will be more rainfall, which is beneficial to the growth of crops. The Grain Budding shows crops that will ripen in summer start to show plump seeds. The Grain in Ear tells people that the wheat has ripened. The Slight Heat and Great Heat indicates the full onset of summer, with the Great Heat being the hottest day of the year. The Limit of Heat shows that scorching summer days will soon be gone. The White Dew tells people that dew appears in the morning to show that the weather is turning cold and , as this intensifies, we move on to the Cold Dew. The Frost's Decent means the appearance of the first frost of the season. The Slight Snow and Great Snow mean the arrival of the snowy season. The Slight Cold and Great Cold indicate the degree of coldness in winter, with the Great Cold being the coldest day of the season (from Common Knowledge About Chinese Culture). 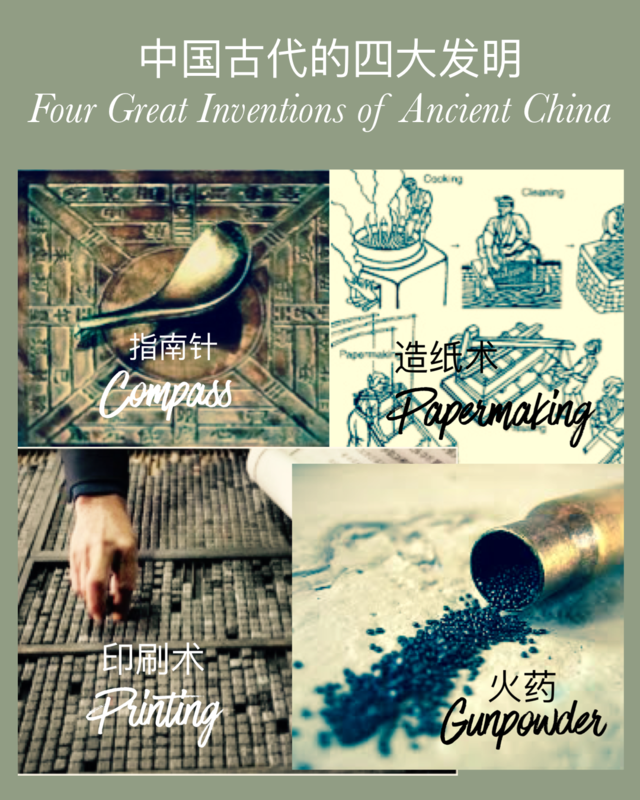 According to 《Science and Civilization》（中国科学技术史）(1954-2015) by Joseph Needham (1900-1995), China’s four great inventions are Compass(指南针), Papermaking (造纸术), Printing (印刷术) and Gunpower (火药). 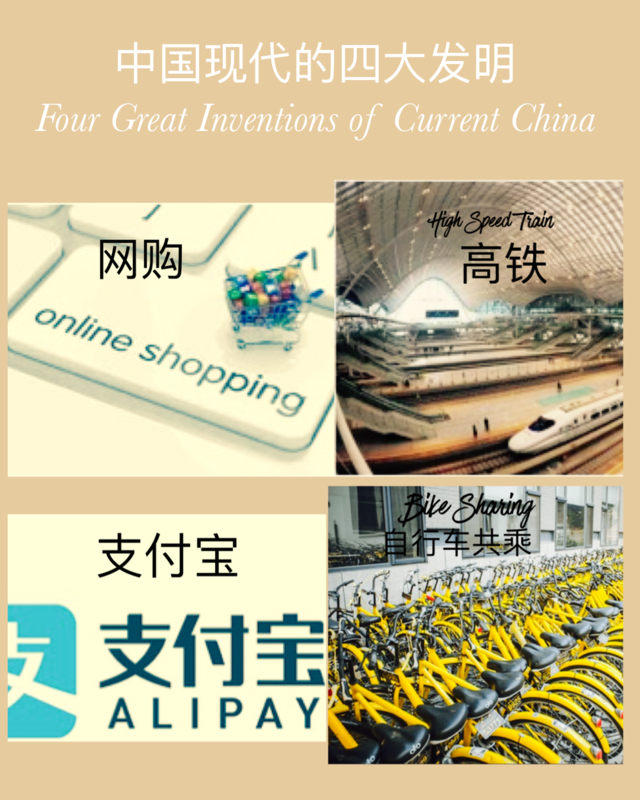 According the study from Beijing Foreign Studies University，the students from over 20 foreign countries voted the current China’s four great inventions are E-Shopping (网购), High Speed Train (高铁), Alipay (支付宝) and Bike-Sharing (共享单车). 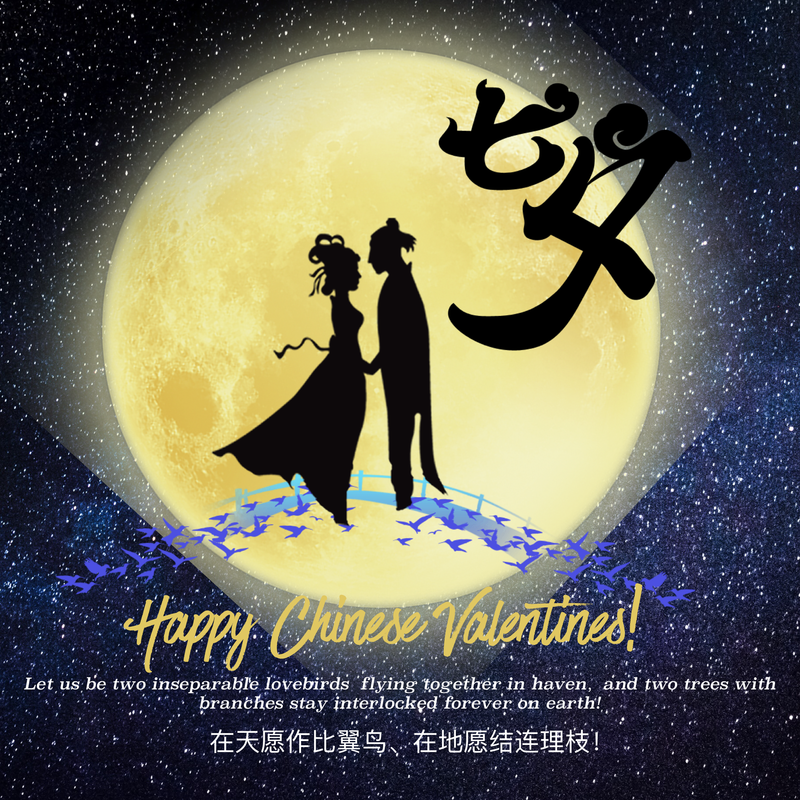 七夕(qī xī, Double Seventh)-- 中国情人节快乐；Happy Chinese Valentines! Chinese Kungfu Star, Donnie Yen masters both the pen and the sword! At the Gala show of the 20th Anniversary of Hong Kong‘s Return to China, Lang Lang's world-renowned exceptional piano techniques continued to be a vocal point. But it was a pleasant surprise to find that the famous Chinese Kungfu Star, Donnie Yen actually plays a good piano too. His hidden great piano skills disclosed himself as the master both on the pen and the sword. 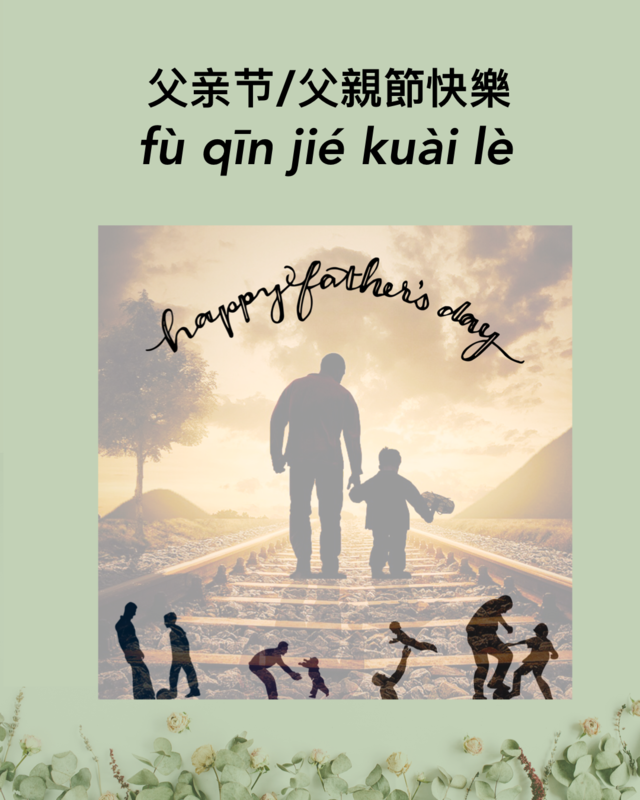 What a great enjoyment at the Father's Day to watch the Piano and Erhu ensemble Lang Lang and his father, Lang Guo Ren did before. It was such a great comfort and achievement for Lang Lang's father to be able to play with his talented and diligent son at the Carnegie Music Hall of the United States. The father played Erhu with such a high pride, while the son focused so much to accompany his father's performance. That was the best domestic bliss of the "Father and Son" I felt at this moment. 感受“世界第八大奇迹”－2000年历史的兵马俑。Experience the Eighth Wonder of the World, Terra-Cotta Warriors and Horses created 2000 years ago. 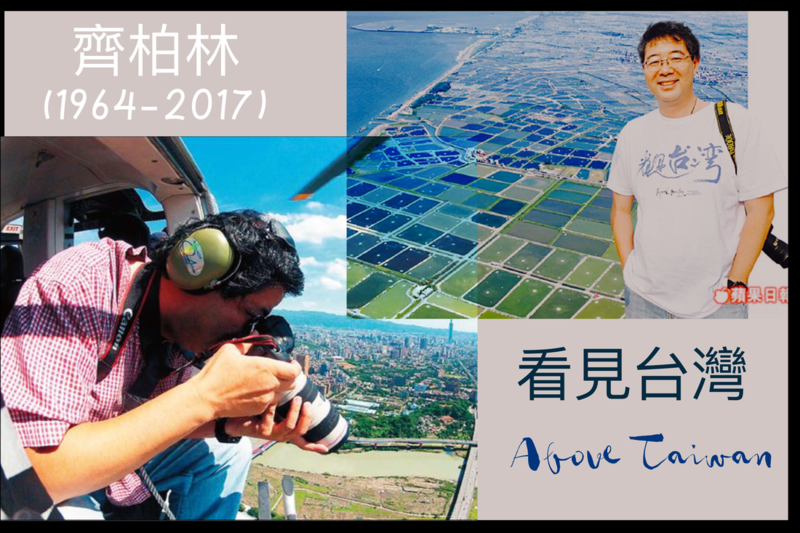 Director Bólín ​Qí's plane crashed while he was in the mission of taking the aerial shots of Above Taiwan. He had dedicated to his life of shooting the landscapes, rivers and ecology of Taiwan. He also strived his effort of bringing the people in Taiwan to promote the environmental protection. 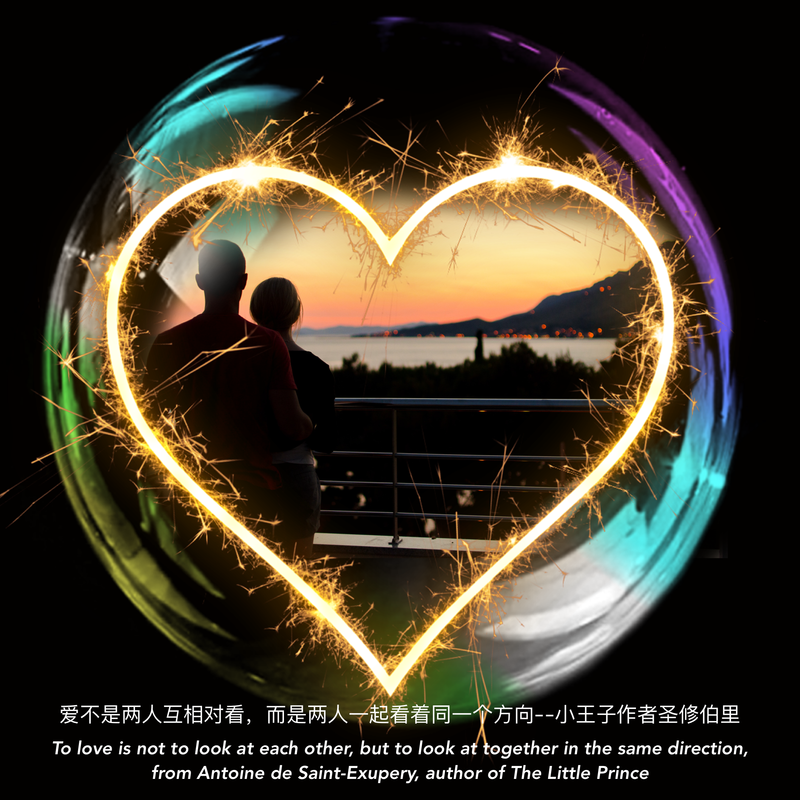 Here, we pay the tribute to his dedication and contribution for his love to the land of Taiwan. Qí, Bólín took the aerial shots of the film, Above Taiwan. 端午节快乐 (duān wǔ jié kuài lè) Happy Dragon Boat Festival! 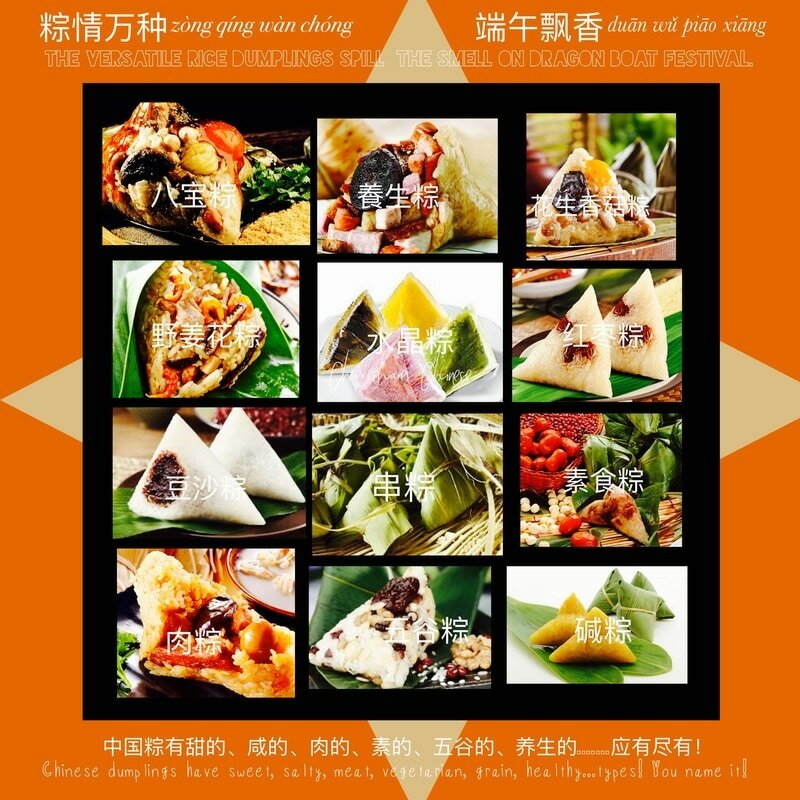 The versatile rice dumplings spill the smell on Dragon Boat Festival! It is dazzling and varied! ​Chinese rice dumplings have sweet, salty, meat, vegetarian, grain, healthy...types. You name it! ​Rice dumplings are not just the Chinese food only. Many countries in the world also have such a delicacy. It is indeed dazzling and varied! 书中自有黄金屋；书中自有颜如玉！Luxurious Dwellings come out of Reading! In the book, there is a house of gold. In the book, there is a shade of jade! 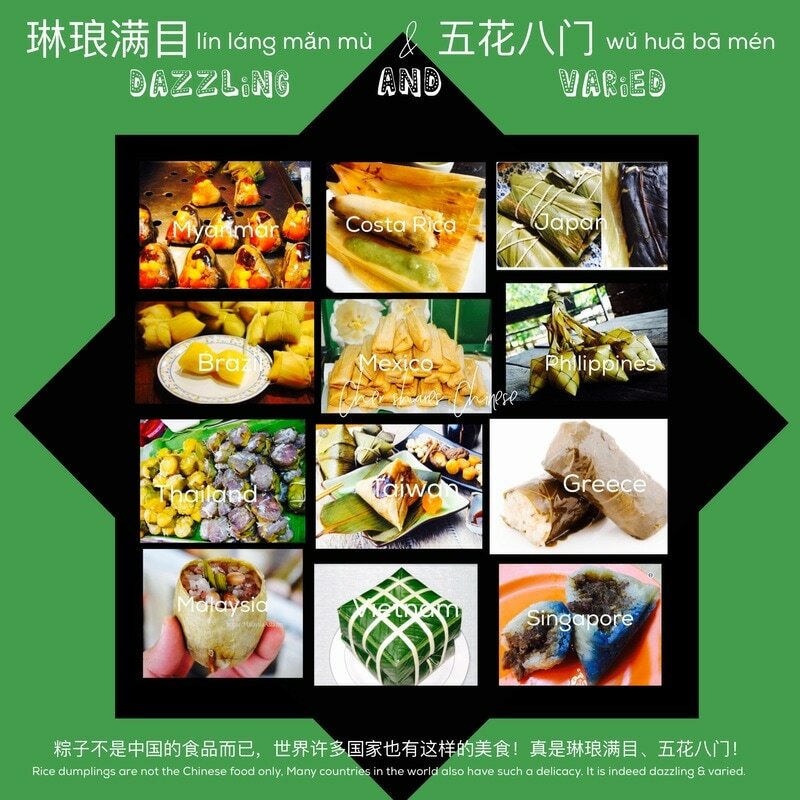 Wrap the rice dumplings to prepare for the coming of the Dragon Boat Festival! Wrapping the dumplings is the important custom for the Dragon Boat Festival (May 5th on Lunar Calendar), one of the three biggest traditional Chinese festivals. 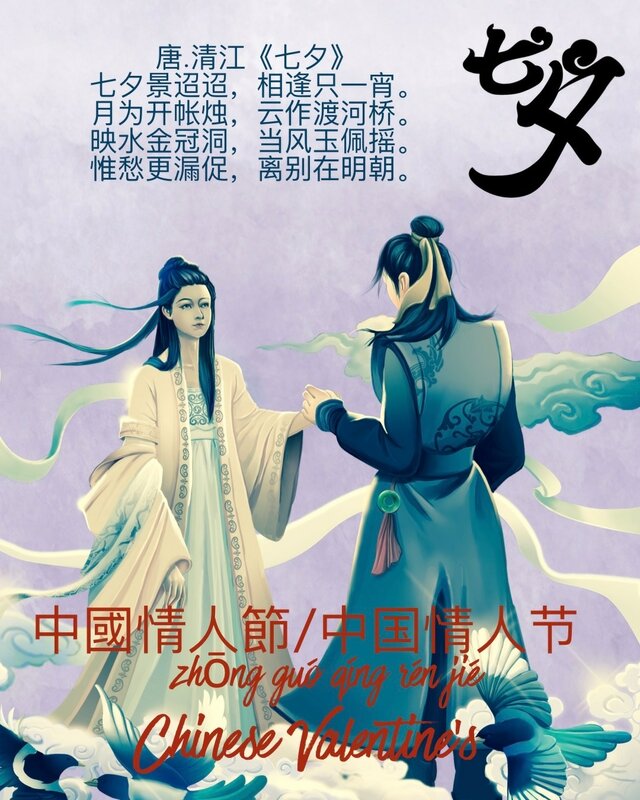 This is to commemorate a great patriotic poet, qū yuán around 2300 years ago on the Warring States period. Due to he was gradually not trusted by the king of Chu, and then leading to the invasion of Qin, he was desperate and drowned himself in the Miluo River. The people made rice dumplings and threw them into the river in order to keep the fish away from eating his body. Making rice dumplings then became an important tradition during the Chinese Dragon Boat Festival in addition to the dragon boat race. ​Who initiated the Dragon Boat Festival? It was said to commemorate Qu Yuan. I laughed even the grand Chǔ River could not clear the injustice of this great patriot. To All the moms~ Happy Mother's Day! Forever Young and forever beautiful! 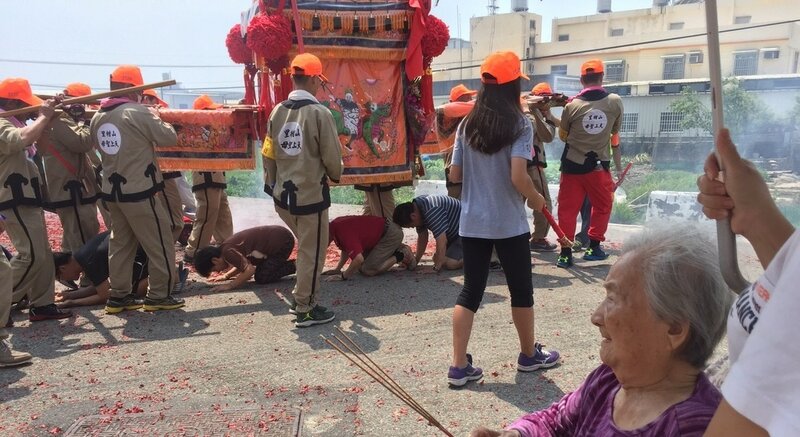 Dajia Matsu Pilgrimage Procession in Taiwan is held annually in March in Lunar Calendar. The tour lasts 9 days and 8 night, which is the important folk religious activity. The messenger ahead of the tour holds a long handle but un-opened umbrella indicating to 'do good deeds often'. The handle hangs a tin pot, expressing to 'cherish happiness', and also hangs a pork shank to symbolize 'content' He wears one no-lens glasses to express to 'see through' the life. The fur vest is worn on the opposite side to show one should know through his own practice. He walks with one bare foot to tell people to be 'down to earth'. 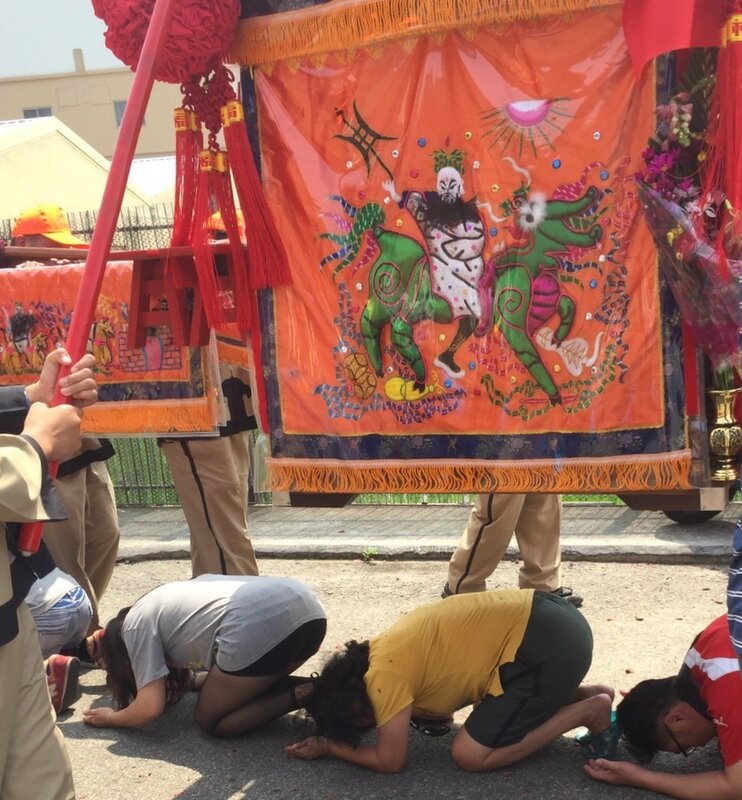 妈祖绕庄头，民间钻轿子祈福。People worshipped and kneeled down under the sedan chair to pray for blessing when Matsu paraded through the villages. 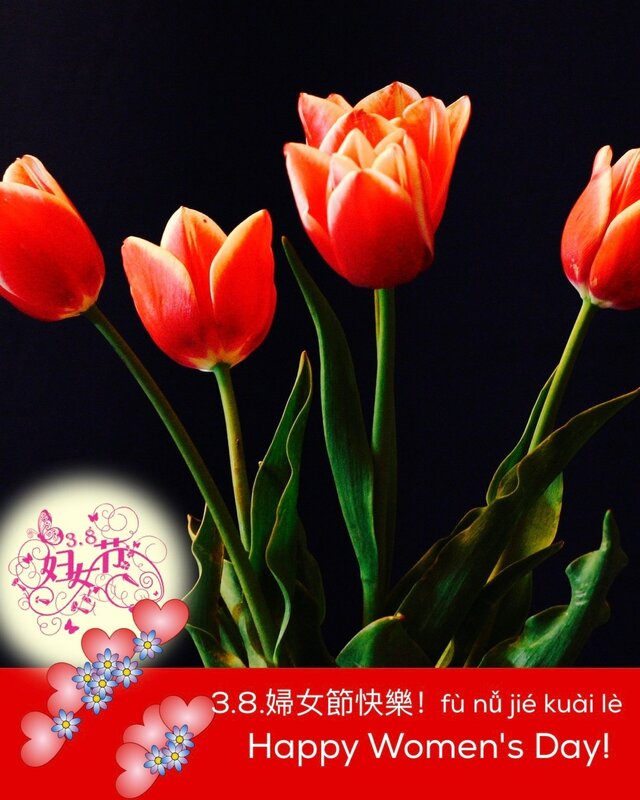 復活節/复活节快乐！(fù huó jié kuài lè) Happy Easter! Easter is also known as the Lord's Resurrection Day, an important festival of today's Christians. Originally it was on the day of the Jewish Passover or the following Sunday, but the church meeting decided not to use the Jewish calendar on the 4th century, so the first full-moon Sunday after Vernal Equinox became Easter. Christians believe that Easter symbolizes rebirth and hope. And it is a story that commemorates the resurrection of Jesus Christ in the year 33 after he was crucified and resurrected three days later. 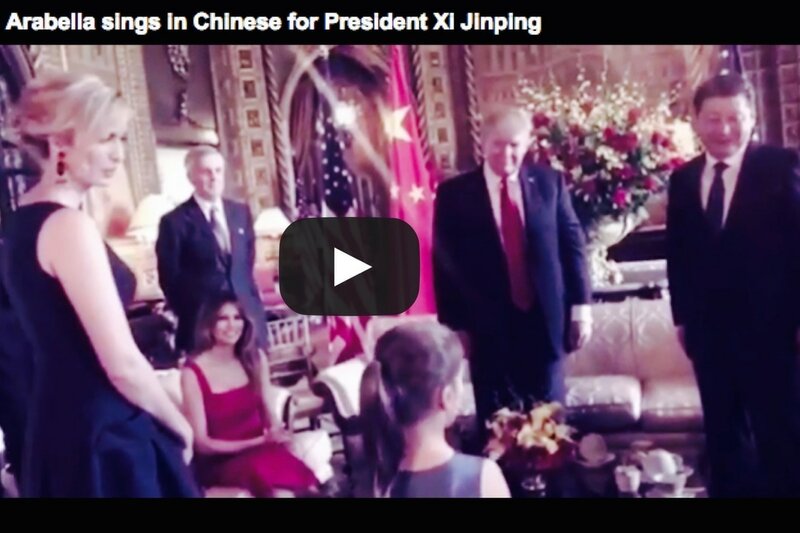 Ivanka Trump ushered her two oldest children Arabella and Joseph to serenade the Chinese President Xi Jinping in Mandarin during his first-ever visit to the US President Donald Trump. Ivanka was eager to give Xi and his wife, Peng Liyuan a warm welcome. Arabella sang a Chinese Folk song called Jasmine Flower and then recited a Three Character Classic. The visit was taken place at Trump's 's Mar-a-Lago estate in Palm Beach, Florida on Thursday. Arabella recited the Chinese nursery rhymes. 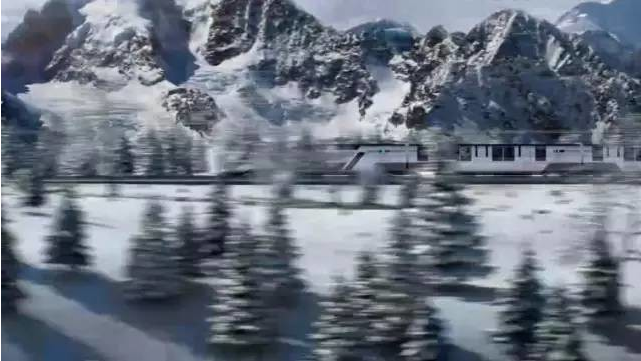 China is ready to launch an Intercontinental High Speed Train that combines to transport the passengers and the long distance cargo freights. 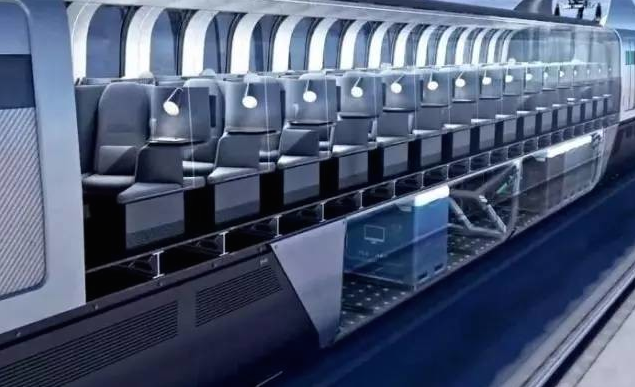 The Intercontinental train blends the unique features of highly intelligent function, integrated body suitalbe for all intercontinental environments, high comfort and passenger/cargo separation. April 4 is the Ching Ming (Tomb Sweeping) Festival. 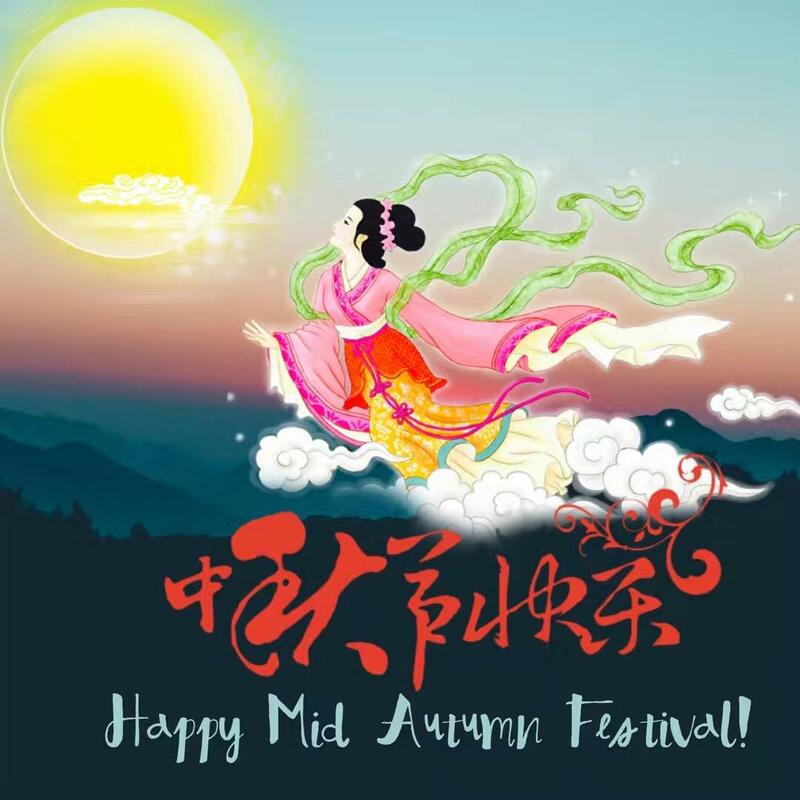 It is ranked as the four important Chinese festivals with the others, Spring Festival (Chinese New Year), Mid-Autumn (Moon) Festival and Dragon Boat Festival. 清明 (qīng míng) literally means "clear" (qīng) and "bright" (míng) because it falls in early spring, on the 106th day after the winter solstice. 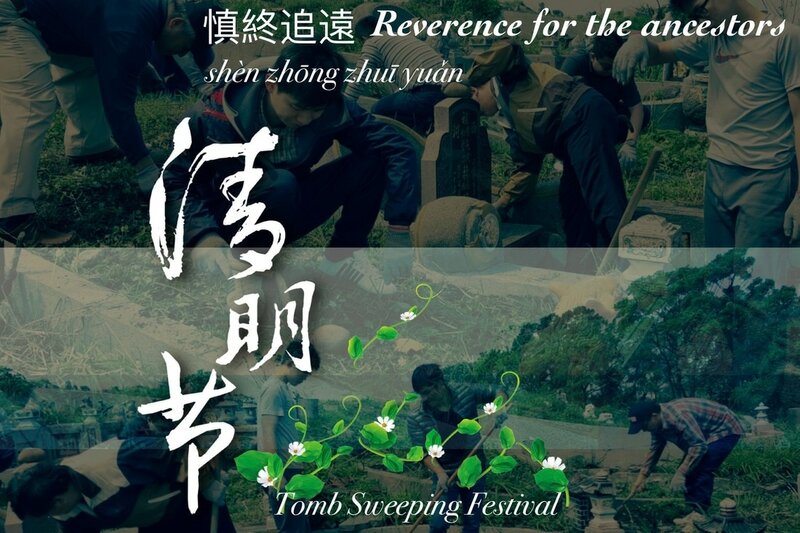 Around this time, families gather together to clean the ancestor's tombs, worship them with sacrifices and express our reverence for them. March 8 Women's Day, is also known as "International Women's Day", "International Labor Women's Day", "March 8" and "March 8 Women's Day". 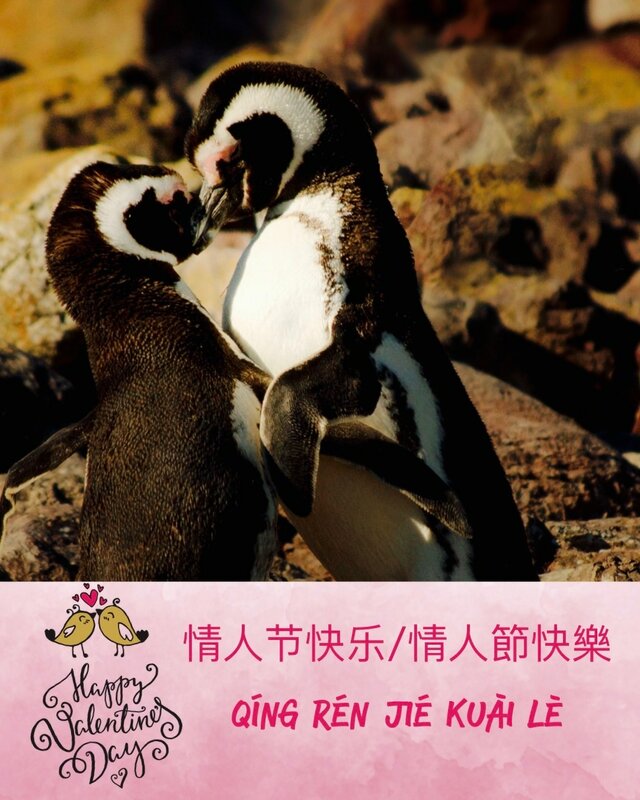 The Chinese Kuomintang Party announced in 1924 that "March 8 is the international women's holiday". 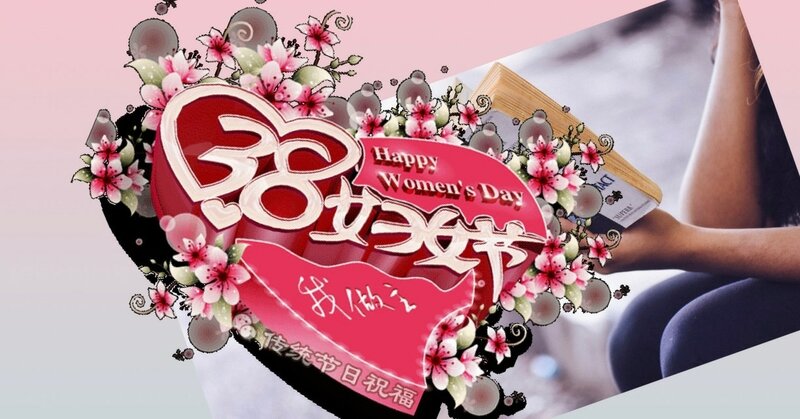 In 1949, the Chinese Communist Party after the ruling, officially set March 8th as the women's Day every year. 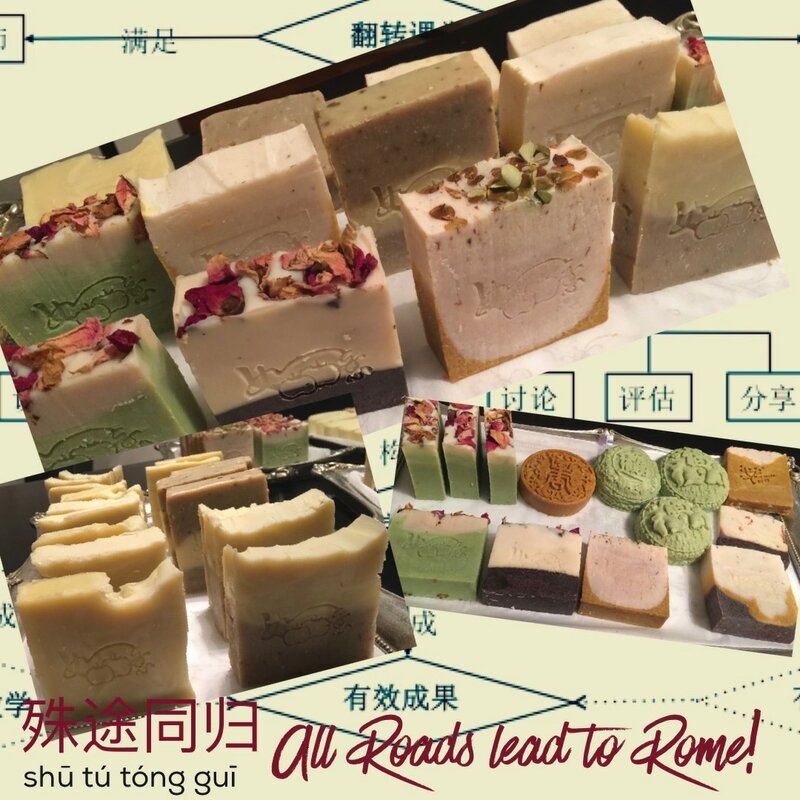 殊途同归 (shū tú tóng guī) All Roads Lead to Rome! Never let your tragedy define your future! There was always such a time, my heart was stirred by the moving story, and moved inexplicably! 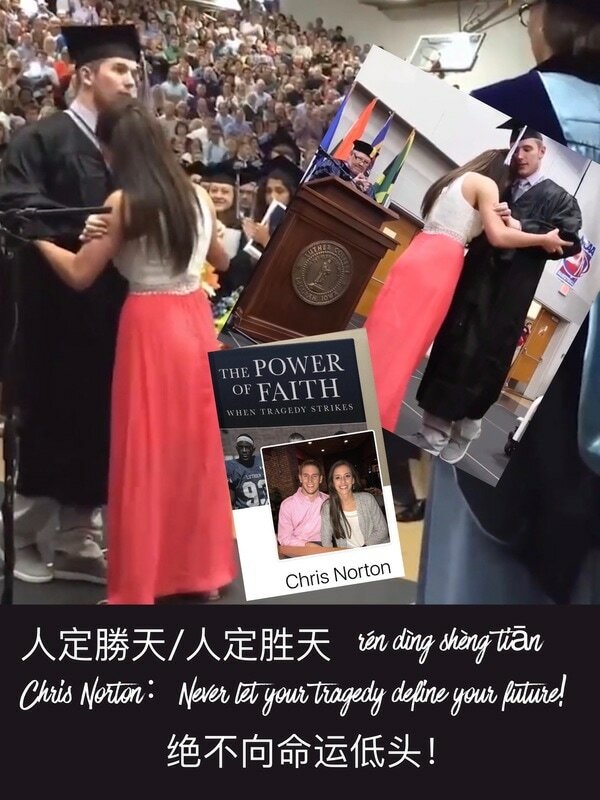 By watching this short film, I could not help but was impressed by Chris Norton's strong wills and perseverance. Six years ago, he suffered a spinal cord injury in a football game and was paralyzed from the neck down. He is not defeated by the fate, on the contrary, he shares his inspirational story to everyone. Watching him move forward step by step, hard yet happily, we cheered that it is his wife to give him the courage and hopes to fight for the destiny. "There is always a great woman behind a successful man"! Chris & Emily. You rock! 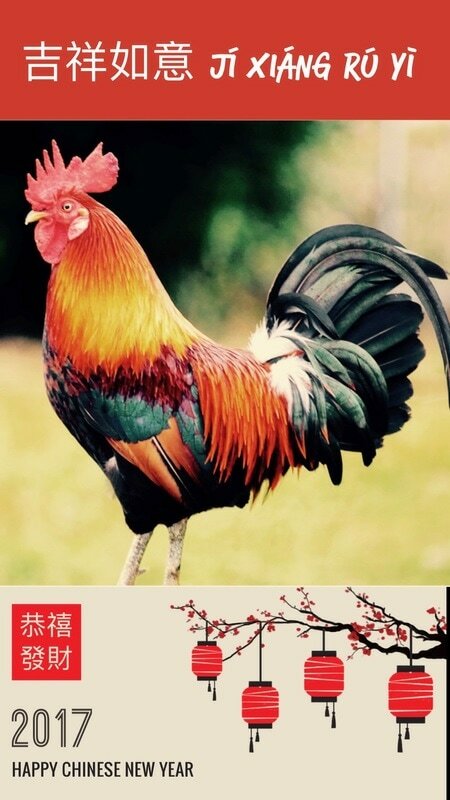 ​Happy Chinese Rooster Year! Wish you the best in year 2017! Gu Gu Gu....Gu Gu Gu! The Roosters shout out loud with their big throats and welcome Chinese New Year of 2017. At the arrival of the Rooster Year, there is no exception for greeting each other with the Rooster-Related Chinese lucky words. 学生和我参加学校举办的国际歌舞欢庆，我们表演旧历新年的庆祝，有年的故事介绍、舞狮、中国武术(刀和三节棍）、一到十的成语新年贺辞、以及跳流行歌曲－小苹果的团体舞蹈。另外一组学生诠释唐李白将进酒的诗词表演。Students and I joined a school-held International Cabaret. We performed a Chinese New Year Celebration featuring “年，Nian ” story, Lion Dance, Chinese Kungfu (Board Sword & Three-Section Cudgel), Chinese Axioms-generated Lucky Words, and a famous Chinese pop-song, “小苹果, Small Apple”. My other group of students performed "The Invitation to Our Play", adapted from "Invitation to Wine" from Li Bai, Tang Dynasty.